* Our normal 5pm and 7pm evening gatherings are combining for an outdoor celebration in the courtyard (weather dependent). The 6pm gathering will be followed by an Easter feast, with donations to go to our CMS global mission partners. Dress warm! ‘What’s up with Easter?’ is an Easter event for kids aged 3-12. Hop on down to Trinity Church Adelaide on Easter Sunday to discover what really happened on that first Easter morning! Meet at 10:30am in the church and then join our ‘What’s up with Easter?’ event in the hall. Enjoy drama, music and activities, then join the egg hunt! 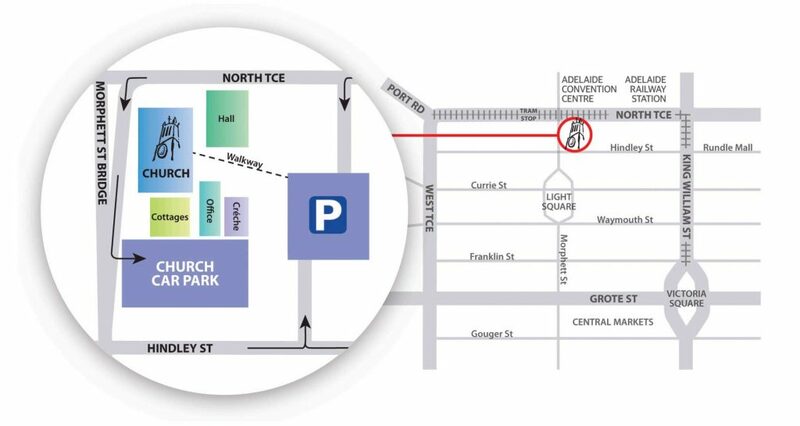 Trinity Church Adelaide is at 88 North Terrace, opposite the Adelaide Convention Centre, and is easily accessible by car, bus, train or tram. You can use Adelaide Metro’s Plan My Journey to find public transport options to get to our location. Free car parking is available in our church car park (accessible from the Morphett Street slip lane), or you can park nearby at Care Park (accessible from North Terrace and Hindley Street) if the church car park is full. You’ll be able to collect a Care Park discount voucher at our Easter events which will reduce your ticket price to $3.